Random Anny .Com: Don't go to a Liquidation Sale without your Cellphone! Don't go to a Liquidation Sale without your Cellphone! As we all know Circuit City in the USA recently bit the dust. The day after their announcement my local store put up a 30% off banner and people flocked. The problem with liquidation sales is they are no longer the original store. 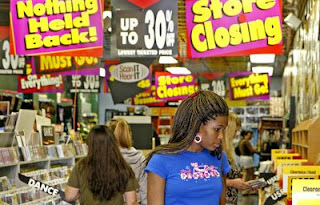 Circuit City sold everything to a liquidator who immediately marched in, marked everything up and then took 30% off of that. Ironically influx of customers thinking they are getting a good deal will lead to the type of revenue which may have saved the original store. Whenever I'm at a store that doesn't accept refunds I text AMAZON the ISBN or UPC number. Within minutes the automated service will give me a price and prompt me to buy it from them. Mobsaver will check both Amazon and eBay. Texting TARGET will get their prices. So next time you're faced with glossy new items and confusing math, text a bot and save yourself buyer's remorse. As always make sure to pay with AMEX. Don't think I've ever been to a liquidation sale, I bet they are quite the experience! Really? What do businesses over there do when they go out of business?